CARAT is always at the forefront. We optimize existing products and develop new ones for you. We discover new trends in the kitchen industry and keep you up to date. Where can you find the latest kitchen trends? When is the next trade-fair where you can meet with CARAT experts? We'll keep you informed of important dates that you can already write down in your calendar. If a question about the use of our products cannot be fully answered by phone or e-mail, our service personnel can help you directly via CARAT's Remote Maintenance Service. 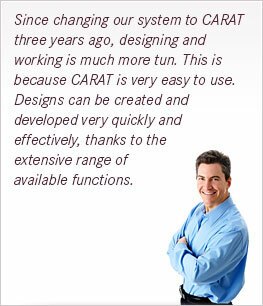 You are in need of support by the use of CARAT products? You would like to suggest or ask something? Give us a call! We appreciate your opinion and are looking forward to your requests. Our experienced staff can be reached five day's a week. The CARAT-Hotline will advice you competent and with the necessary know how about our soft- and hardware products.